One of the reasons I love whisky, rum, wine, beers and alcohol in general is the huge variety that is available, there are so many thousands of different styles of alcohol and then in each one there are again thousands upon thousands of different producers with so much to explore and try. 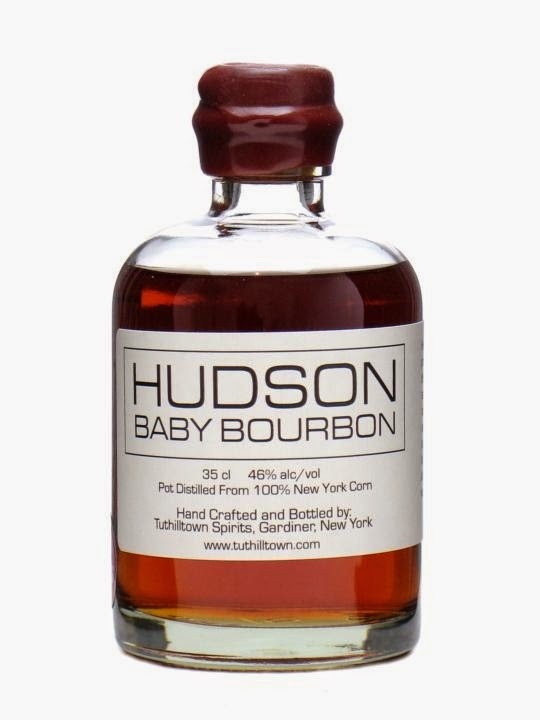 I was very kindly sent a bottle of Hudson Baby Bourbon to review and honestly having not delved too deeply into the world of American whiskies it isn't one that I had really heard of, although the bottle was somewhat familiar. Hudson is the first New York distillery since prohibition aiming at producing fine craft, small batch products with each bottle being hand numbered. The Baby Bourbon is a single grain whiskey made with 100% New York corn and is aged in small 2 gallon oak barrels for less than four years. The corn percentage is a seriously unique point, to be classified Bourbon a whiskey needs to have at least 51% corn, with almost none going all the way to 100%, the distillery also uses sonic vibrations to agitate the whisky to help speed up the maturation process. I love innovation just as much as variety when it comes to my booze and it is certainly present at the Hudson distillery. On the nose the initial hit is pretty reminiscent of old aged rum with burn sugar, caramel, oak, tropical fruit and some vanilla. The nose is nicely perfumed, but really overt with a huge amount of oaky wood overlying it, for me it is definitely pleasant, but without a huge amount of depth to it. On the palate this baby shows some weight it is big and viscous with a heavy mouthfeel. It is at 46% and quite young spirit and so has some heat to it, but there are some nice notes there again with burnt sugar and oak leading the charge, there is some fruit and vanilla coming through as well with just a touch of pepper. This Hudson whisky is a big and brash cousin to our own native Single Malts being very sweet and woody, it is definitely the right sipping whisky for someone, but would also be phenomenal mixing with such a big and bold flavour. I did enjoy this whiskey, it was quite a dispatch from what I'm used to, it retails at around £40 and is a bit much for me personally for a half bottle, but I think there is promise there and if the distillery starts releasing some more aged stock then I'd be more than happy to give that a try too. This makes a great introductory whiskey due to its sweetness, but will definitely intrigue the more seasoned drinker. Great review - I looked at it recently here (http://www.greatdrams.com/hudson-baby-bourbon-review/) - great whiskey and one of their better releases I think.